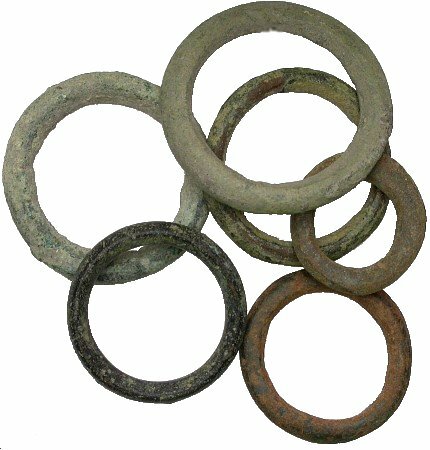 Long before the introduction of struck coinage into ancient Celtic Europe, copper and gold rings were used as currency by Celtic tribes and were often worn on clothing or tied together by ropes. Before coinage was introduced to Britain in the Late Iron Age, people had to conduct transactions by bartering their products, goods and/or services. This process of payment and exchange may have been facilitated by gold “ring money” (most of which seems to date from the late Bronze Age, therefore they are not ‘uniquely’ Celtic and may not have even been used by the Celts as a ‘proto-currency’). For example, we now know that by the 2nd century BC (the Late Iron Age in Britain) the locals were trading iron “currency bars” shaped like swords, spits, plough-shares and bay leaves. The use of the so-called ‘ring money’ as a proto-currency may have died out well before this. They may have also traded neck torcs and arm bands of gold, silver and bronze. Gold ring money ca. 1,000 BC. Ring in torques form. The body is twisted as decoration and ends in plain pointed terminals. 4,39 g. van Arsdell p. 61, 1. Cf. UBS Auction 59, Basel, 29 January 2004, lot 4006. Extremely fine. Ex Auction UBS 78. Zurich, Sep, 2008. Many archaeologists and historians believe that ring money made from ‘bronze, of silver, and of gold’ was used by the Celts in trade from Ireland to the Danube region. However, the dating of Celtic ring money is uncertain. Others claim, however, that although the rings vary in weight; they are all multiples of a standard unit, indicating a uniform principle regulated their size, i.e. their use as a ‘proto-currency’. They might even be ‘left-overs’ from chain mail armour, common in Medieval times. ← Why have no Celtic coins ever been found in Ireland ? 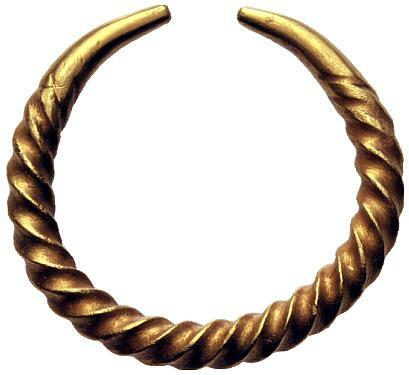 Would it be reasonable, then, to use gold rings as currency in fiction set in the late bronze/very early iron age in celtic-inspired societies? If I were you, I’d put that question to TWO people at the British Museum – firstly someone specialising in the Late Bronze Age and, secondly, someone specialising in the Early Iron Age. They should have the ‘latest’ insights. My understanding is that the so-called gold ‘ring money’ belongs to the Bronze Age but its extended use as a proto-currency into the Iron Age is in some doubt. Since you are talking about fiction, you would have the benefit of applying some ‘artistic license’ to the scenario. By the 2nd century BC (the Late Iron Age in Britain) the locals were trading iron “currency bars” shaped like swords, spits, plough-shares and bay leaves. Would any of these items fit in well with your ‘fictional account ? The use of the so-called ‘ring money’ as a proto-currency may have died out well before this. The people at the British Museum would be better placed to comment on the Late Bronze Age / Early Iron Age transition period.